How To Install Adobe Air On Ubuntu 64bit - OMG! Ubuntu! 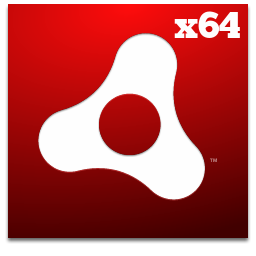 Whilst Adobe provide a 32bit version of their Adobe Air application for Linux, a native x64 version remains a dream. Thankfully, with few installed dependencies, the 32bit version will happily run on a 64bit installation too. First things first – you will need a copy of Adobe Air for Linux. The link below will take you to the download page. Next you will need to download and install a package called ‘Getlibs’. What is it? ‘Getlibs’ is a clever little tool that helps install 32bit libraries required for an application to run in a x64bit environment. Save the .deb from the link below and install it by double clicking on it. Now comes the boring part! Once the above have finished installing, you will need to paste each of the commands below into the terminal separately. Now install Adobe Air by either dragging the AdobeAIRInstaller.bin file into the terminal with a ‘sudo’ preceding it if needed or by being all posh and doing it the proper way as bullet-pointed below. You should now be able to install and run pretty much all Air Applications around – although some are Windows/OS X only, most are not.